It's been a while since I've read a book that I will enjoy, I was under the reading slump spell *lol* and this book pushed me out of it. I like how the author wrote the setting of the book, like a combination of the a roman empire and tribal era, aside from that it has a magical side of the story. Every character is special, they have a hidden ability that comes out without them noticing. Laia is a slave who used to live with her grandparents until before her brother was incarcerated by the people they called Masks. Keenan, is part of a rebel group named Resistance, he hates Laia the first time they met because he thinks she will just bring danger to them. Elias, is a soldier, he's one of the Masks, but at the same time he wants to turn his back from the empire and be free. Helene, is Elias' best friend and a soldier too. Laia and Keenan's rapport is better than Laia and Elias, that was just my observation while reading the book. I'm thinking of them and I'm getting more excited when Keenan and Laia meets. 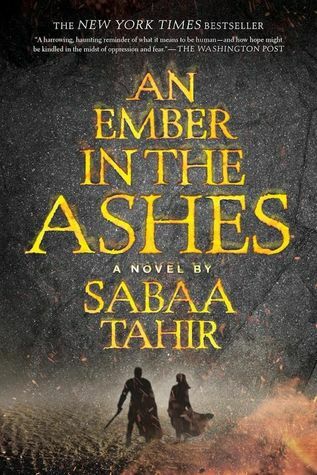 Laia and Elias on the other-hand is good but it was more like they are just friends or just an acquaintance but then, I am hopeful and looking forward to reading the second book A Torch Against the Night. Despite the character's romance confusion, I still enjoyed the story. It is a promising and interesting book. I do recommend this book to readers who love young adult or dystopian type of books. Question for the readers: Who do you think is the best guy for Laia? is it Keenan? or Elias?